The FreePBX team is intensely dedicated to the ongoing success of this project and works tirelessly to make sure you continue to have a world class, feature rich and future proof system to bank your business and your customers’ businesses on. We are grateful to the community members who participate in the project - feeding ideas, code and project help to keep us moving forward. This change being announced will go a long way in assuring we can continue to do that. Whether you’re a consumer of these specialized modules or not, all of you depend on the continued investment in the core project’s long term viability. Enabling our ability to fund the ongoing support of these modules through renewals that have always been part of the licensing terms in our EULA will assure that we can continue providing the resources needed for all sides of the project and benefit everyone! I can totally understand the need to fund this project, but I have a suggestion. It would be nice if when your cut off from the upgrade it stops on a stable version. -Let’s say I haven’t upgraded my commercial modules for two years and then I decide I want to. Do I have to pay for cumulative upgrades for both years? -We purchased system builder plus. Would be nice if you offered a way to purchase upgrades for the whole package, so I don’t have to chase them individually.
" Do you want to keep still updated your already bought commercial modules ? it is no more free, you have to pay! " Ok I can choose to update no more any commercial module: could it still work with all the next FreePBX core updates coming in next years ?? This is not a direct criticism to al the original FreePBX staff (all of you boys that offered us this great product and this great support) but all of us now clearly see the Sangoma lion’s paw in forcing the great company pitiless commercial ways. I’m sure it will be of no great benefit for FreePBX project. Please let me sincerely know if I’m wrong with anything I’ve understood. 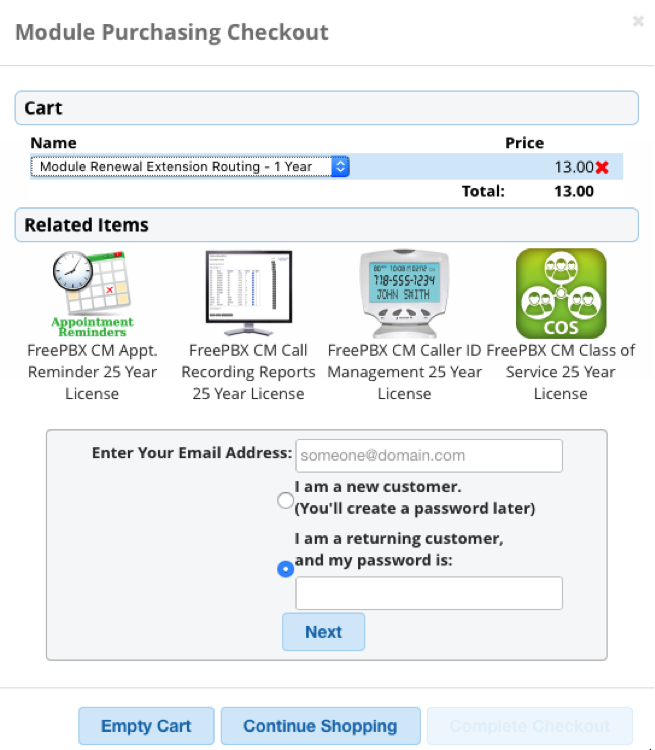 You do NOT have to purchase renewals and your commercial module will continue to run on the current version of FreePBX that you’re running on. If there’s a core update within that version that breaks a commercial module, it would almost certainly be considered a bug in core that we would fix core. This is consistent with how we’ve always operated, because there are outside parties that write their own modules or lots of custom implementations by our user base that depend on maintaining compatibility. So there is no expectation that the release of a core or other non-commercial module will result in you having to update the commercial module to fix that. The cost to obtain upgrades is described in the EULA and has always been there since the introduction of commercial modules over 4 years ago. In your example, you only need to purchase a 1 year upgrade of $143.10 which will cover you until Nov 15, 2016 assuming your module is over 1 year old. The options for multi-year purchases is for the convenience of users who want to “get ahead of the game” and/or want to take advantage of the RENEWALS discount currently being offered. I’m sorry that you have an incorrect perception of Sangoma on the project and think that the stewardship of Sangoma is the cause for this change. That is about as far from reality as can be. The need for this has been mushrooming for over 2 years, and the designs and mechanisms have been put in place behind the scenes over that time to enable this. Sangoma’s stewardship of the project is less then 1 year old. In plain english, this started before Sangoma had any knowledge of it. On the flip side, Sangoma’s stewardship is what has allowed us to pour a tremendous amount of resources into getting the incredible investments into FreePBX over the last 10 months that have resulted in some of the most substantial and exciting improvements, additions and modernizations of FreePBX in version 13 and other areas that have every been done, and never in such a compressed timeframe. If you haven’t read the blog but only the email, go read the blog which goes into slightly more detail. I hope this clarifies your questions, and I’ll re-iterate, you do NOT have to purchase a renewal if you don’t want, you can keep using your modules. November 16th, 2015 is the “earliest” expiration date that anyone has, whether you purchased the module 13 months ago or 4 years ago. If you choose not to update, and then 1.5 years later in May, 2017 you decide to update, you would have to purchase 2 years of updates which would cover you through Nov 15th, 2017. That would be the case even if you purchased your module 4 years ago. We understand your request concerning bundles. At this time we don’t plan on having bundle level upgrades and for some users that is preferable as they may not be using all the modules in that bundle and may not want to pay for renewals for all of them. We will be evolving the renewal purchase process though to make it easier to manage multiple renewals. I haven’t read the blog yet when I posted my question, now it’s done. The major doubt i had , was the third avayax asked for, so…we’ll see how it goes. My concern is going to be engagement. I always have supported the commercial modules and happy to pay for them; the constant updates kept me engaged and interested to see where the product was going, and in turn I bought more commercial modules as I ran into something I liked. Honestly, I see myself sitting on my current licenses now until I absolutely have to make a change. I have bought a lot of modules that I probably didn’t need (e.g. Zulu) because I ran into them while meandering around updates in the system and with the idea I might grow into them. If I do an update, it will surely only be the core modules I use, and I am sure that I will be more cautious about whim purchases. I am curious, I bought two zulu licenses(one of those whim purchases) a few weeks ago, and the product is not even launched yet. I hope that my update license will start counting on release not purchase? Telephony is not my profession, and maybe this won’t be the case for the majority of the people, but it is my assumption that there are a lot of small business owners out there like me who are engaged in the product and have enjoyed tinkering/working with it. For decades our PBXs were install, configure and then they sat the same way for years. I fear that will be rut we will get in. I know that you guys spend countless hours working on this product, and I am sure lots of consideration has gone into this. My hope is that the renewal prices will be carefully based on the actual amount of work needed to improve the modules. Understand and in the case of 13, that has been the case. But 13 was basically a complete rewrite of the overall GUI and some major internal plumbing changes as well. That is pretty rare to go through such an overhaul. If you look historically, major FreePBX releases have not affected most modules. We have our own vested interest to keep such forward compatibility usually. If we make underlying changes that require most modules to be upgraded, it turns into a huge burden on us, it means we have to go update and test over 100 modules and that’s a LOT of work. As such, we usually try very hard to NOT do that such that the only modules that have to be changed in a new major release are those modules that are having new features written or other specific module work being conducted. As it turns out, one of the fundamental changes we did back when we moved from SVN to Git was to change how module’s themselves are managed. It used to be that when we did a major release, every single module was ‘forked’ into a new branch, even though most of them were identical. It was a headache because it meant any minor bug change would have to be copied to each version of what is otherwise the identical module. The change we made was to allow modules to exist on their own branch and we could specifiy what major versions of FreePBX that module was supported on. That way, if a module still worked on a new version of FreePBX, it would not be changed and we can maintain it in the identical branch. Given how extensive version 13 was, it’s currenlty our intent to take something of a breather and have the next version 14 be a much smaller bump. We have no desire to cause ourselves to again have to go touch over 100 modules if we can help it. So … I hope that helps you see a closer glimpse into what’s going on, and to see that the actions and decisions that are being made are consistent with what the FreePBX team has always done which is to continue our ability to keep focused on making the key FreePBX project awesome by NOT having all resources consumed to support the huge number of commerical modules that has grown over the last 4 years. Honestly, I see myself sitting on my current licenses now until I absolutely have to make a change. And we explicitly designed it so that you can do this. And for that reason, we’ve also explicitly made sure that you can see if there are updates availalbe and the changelogs that have always been there for modules that you haven’t renewed. We’ve tried to keep it as transparent as possible so that you can choose if you want/need the new updates. For decades our PBXs were install, configure and then they sat the same way for years. I know that you guys spend countless hours working on this product, and I am sure lots of consideration has gone into this. My hope is that the renewal prices will be carefully based on the actual amount of work needed to improve the modules. As mentioned in the blog, none of this is new. Anyone who has ever purchased a commerical license has had access to the EULA associated with it which has alwasy indicated a renewal fee, which is thought out and based on realistic estimates of what it takes to maintain and continue evolving them. In some cases, such as End Point Manager, the renewal fee only subsidizes the cost, it doesn’t cover it at all, since a module like EPM involves full time engineering to keep up with a continously evolving collection of dozens of providers and hundreds of endpoints. I hope that clarifies some of your concerns. As far as Zulu, it has a differenet licensing model. The pre-release purhcase you made would normally be limitted to 20 seats but the promotion you purchased was for unlimited seats. The licensing terms as far as renewals will be based on the date it actually releases as if you had purchased it that date, so you will get the benefit of the unlimitted seats but as if you purchased it when it comes out. I would like to take this moment to ask that you institute an “upgrade” or “trade in” process for commercial modules that offers a discount to users who are looking to step up to purchasing more modules. This is something I’ve ran into and asked your support. It can be very upsetting to purchase System Builder Plus to realize you really should have just went all out on Call Center Builder because you need VQ Plus and/or QXact Reports. Perhaps that realization comes a month in, maybe it comes 2 years in. I know a lot of people that use FreePBX don’t do telephony all day, every day. It is very easy to make a mistake that basically makes your $525 purchase useless and requires you to spend $1275 all over again (or in the case I gave $475+$795, at which point you might as well just by the $1275 call center bundle). Major Security Vulnerabilities. If plans haven’t been made to allow patching of major security issues that might arise in commercial modules without requiring someone to purchase renewals, I STRONGLY recommend you reconsider. EPM. How is this going to work with EPM? Firmware updates won’t get pushed to me anymore after the first year? New phones won’t show anymore after the year? For me, I use the same phones for a LONG time, they really don’t change often and there are only a handful of popular brands and models anyway. But firmware is something I constantly update because it is a simple way to make sure new features and bug fixes get pushed to phones. Yealink is what I use. Some of Yealinks firmware updates even address issues the phones have with FreePBX and other commercial modules. If this stops I’ll have to consider looking for a way to upload firmware to EPM on my own (is that even possible?). System Admin Pro. So after the first year, does the ability to upgrade FreePBX through the GUI stop? I’ve had a handful of issues with it to begin with (updates saying they complete but nothing actually happens or updates not showing up in the GUI and having to do them manually anyway). As someone else mentioned, bugs. I really hope that the “year” isn’t some hardcoded thing because if you guys release a module update that breaks something or introduces a substantial bug, people are going to get very upset that something they paid for doesn’t work. People are much more forgiving of these issues when you can submit a bug report and know that more then likely someone will fix it and it will get pushed to you through a module update. When that stops being the case people are going to be much less forgiving of issues that prevent the module from doing what it is supposed to do. Also realize that this will surely cause a decrease in the number of users running the most “recent” modules, which means less testers and less bug reports, but not necessarily less bugs. I’ll stop here as I have work to get to. But I sure hope this doesn’t negatively effect my deployments. Firmware updates won’t get pushed to me anymore after the first year? New phones won’t show anymore after the year? I will let @plindheimer answer the rest. On your point 4, if you are referring to outside bugs that break an exisitng commercial module, as already addressed, such bugs are almost always a bug in the source outside of the commecial module and as such are fixed there, not in the commercial module. If you’re referring to releasing a new commecial module version that introduces a bug, that is always possible, software has bugs, in all industries. We try hard to test and avoid them but they do occur. As I’ve indicated elsewhere, this is not a “change” as the license has always only included 1 year of updates, consistent with lots of software. In many cases with other licenses, you can’t even get support after a few months. We tie both the renewals and support access to the renewal license so we don’t create that restriction. You are right that there will be some impact on people not downloading the new modules. Given our stats and the general industry trend, we don’t anticpate this changing substantially. There are many people who don’t run the latest simply because “if it isn’t broken, don’t fix it” mentalities or they are just too busy and the PBX is sitting in a closet. This isn’t going to change anything for that contingent. There are also many people who do upgrade whether to keep current, get new features, etc. And what’s common to everyone is an expectation of strong commercial / mission critical support of the commerical module base and the FreePBX Open Source base that it runs on. This ensures that we can deliver on that and it’s why it’s always been part of the licensing. Alot of your questions are laid out in the wiki already. Glad to hear. Did not know that. It sounds like sys admin Pro will be an exception since it is so tightly coupled to the core freepbx distro. I leave it to the devs to say where most bugs exist. I know I’ve had a fee bugs, but I don’t dive into the code fixing it to know where they originated… EPM Examples; dual patterns stopped working, firmware slot selection stopped working, editing the basefile wouldn’t save changes, I’m having an issue currently with not being able to save changes to an extension ucp custom settings from EMP just get errors in the gui (they don’t pick up the default template option but instead are using ucp custom settings but those are blank for some reason), and a few in forgetting. EPM is excellent so don’t take my comment the wrong way, but some of those bugs would make it near impossible to use if not addressed. System admin just doesn’t always work for updates. Nothing would get the latest -6 upgrade to take +even though the GUI said it did) and I ended up on the CLI instead. I’m just thinking of the user who submits a ticket because something is broken in a commercial module. It takes 3+ months to address the problem created by that update. Meanwhile the user runs ocer the license period since they only had 2 months. Tgey don’t get the fix. That’s unfortunate IMO. I doubt we will ever see an upgrade/trade up system. Unfortunate. Someone who spend ~$600 in a bundle and after a month they realize they need call center (didn’t realize they couldn’t make a queue work now they wanted) isn’t trying to game the system, just looking to reasonably compensate you without double paying. It takes 3+ months to address the problem created by that update. Meanwhile the user runs over the license period since they only had 2 months. They don’t get the fix. That’s unfortunate IMO. Bug response time is completely dependent on how quickly it gets reported, the severity of the bug and other factors. We triage ALL bugs weekly, and in between that time we monitor everything. There are bugs that get fixed in hours, others much longer. It’s a matter of resources, bug priorties, availability of temporary work arounds, etc. No different then any software. I doubt we will ever see an upgrade/trade up system. Unfortunate. Someone who spend ~$600 in a bundle and after a month they realize they need call center (didn’t realize they couldn’t make a queue work how they wanted) isn’t trying to game the system, just looking to reasonably compensate you without double paying. I forgot to comment on your inquiry in your earlier comment on bundle upgrade programs. We have not had any such programs in the past though we’ve had some pretty incredible sales at time. (Think Cyber Monday, it’s coming up VERY soon!) That does not mean we would never do such programs. We are constantly evolving our capabilities and always listening to our customers and resellers. I can say that today we don’t have the technology built into the portal to create such an “upgrade bundle”, and doing an upgrade would require us to enhance the system to do such as it wouldn’t otherwise scale. That doesn’t mean we will never do it, but it means we can’t just decide to do it today even if we thought your idea was a great idea since we have to have a way to implement it first. Could you verify that the support licensing is required to be for consecutive years? If I am reading this correctly in your example if we move the date out 3.5 years a person would have to purchase years of support for every year the module was not under support to get to the current version therefor having to purchase 4 years of support for the module to get the current version. Is that accurate? If so I am not seeing that reflected in the ToS unless I am not reading it correctly. At that point for some modules it almost makes more sense to repurchase the module in question depending on the cost of the module vs the cost of support. At that point for some modules it almost makes more sense to repurchase the module in question depending on the cost of the module vs the cost of support. You always have that option, though for modules over $100 it would take several years for that to be cheaper and for modules under $100 it would take over 3 years. 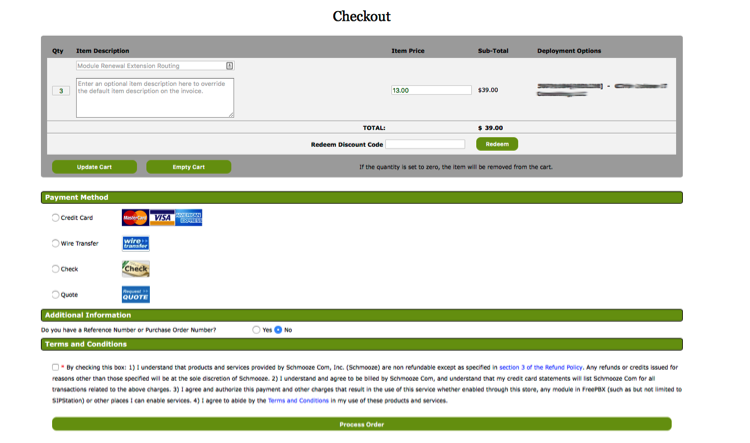 The modules come with a year of updates and support from the purchase date. After that, renewal contracts start from the date of expiration, so the information is correct.